Based on Beef Protein Isolate, Carnivor is a potent protein powder with additions of Creatine Monohydrate and BCAAs that give it additional kick. When looking for a substitute to Whey or simply want to experiment with new proteins, Carnivor is your go to supplement. When looking to really start hitting the gym to build some muscle and generally improve the physique, most of us start taking protein powder as a supplement to our diets. Almost anyone who goes to the gym on a regular basis uses the stuff, but there are so many to choose from. And the vast majority picks whey protein without giving it much thought because it is simply the most popular one of the bunch. But the reality is that there are plenty of other protein powder options out there, which are not based on whey and still produce great results. One such product is certainly Carnivor by MuscleMeds, a protein powder that is based on Beef Protein Isolate. What Is Beef Protein Isolate? Beef Protein Isolate is the main ingredient in Carnivor and a powerful protein in its own right. Medical studies have proven that Beef Protein Isolate can enhance Some claims have been made that Beef Protein Isolate is even more concentrated than Whey protein which would make it the best protein out there, but in either case it is certainly a potent and safe replacement for Whey. 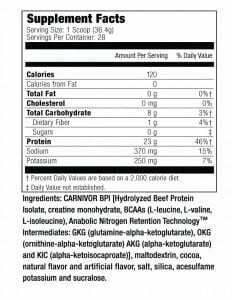 The main ingredient of Carnivor is Beef Protein Isolate. This powerful protein brings additional micronutrients with it, which makes the compound enriched with the likes of Vitamin C, Riboflavin, Niacin, Calcium, Prosphorus and other important micros. Every serving also contains 2.5 grams of Creatine Monohydrate, the most potent creating out there, along with several BCAAs, namely Lecuine, L-Valine and L-Isolecuine. The compound also contains Anabolic Nitrogen Retention Technology Intermediates which further enhance the potency of the product. Carnivor is not a 100% protein as the powder also contains 2.5 grams of Creatine and a number of valuable minerals and vitamins to top the 23 grams of protein and 8 grams of carbs in every serving. This makes for a more complete formula than most Whey concentrates and gives it some additional kick. Looking at the price of $25.99 per 28 servings, this mix comes out to under $1 per serving and considering all the ingredients Beef Protein contains such as Vitamin A, Vitamin C, Magnesium, Potassium and others it is certainly a pretty good value per dollar. I really liked this protein power. Very easy to mix and it was smooth and delicious. I liked that it was versatile in that I could drink it with almond milk or just water and it still tasted great. A lot of protein shakes upset my stomach but this one didn't even if I drank it on an empty stomach. Def will buy again! Smooth protein, did not give me the stomach issues other protein would give me. Would recommend to anyone that has diary issues. I think the flavor is very good. It is possible that the flavor I got (Chocolate Fudge) has been reformulated for flavor and may be better than it was early on. Overall it gives me a boost and is helping me build. We can certainly not fault anyone for sticking with Whey Protein but if you are looking for a change of pace, like the additional ingredients of this protein powder or simply want to check how Beef Protein Isolate compares to Whey, Carnivor is certainly a good choice. This product comes at an affordable price and certainly will not lag far behind any protein powder you may be using at the moment, so give it a shot and let us know what you thought of it. Order Carnivor Now For $25.99! What to do if I m having loose motion because of carnivor?? ?and also can I use carnivor with Carnitine??? I have the same problem ….. I just stated with Carnivore …. just 1 day & having bad loose motion … pls advise to continue or stop. There is no side effect. The development is slow, no side effects.